Home › Home and Kitchen › Modfamily Mini Plastic Bag Sealer Reseals Mylar And Cereal Bags For Airtight ..
Modfamily Mini Plastic Bag Sealer Reseals Mylar And Cereal Bags For Airtight ..
AIRTIGHT SEAL: Creates airtight seal and prevents food from tasting bland and stale. Locks in freshness and flavor. Safely seals all types of bags. Works best with mylar (i.e. potato chips) bags. Color:White LOW Sales Price and BULK DISCOUNTS offered above! So Simple: Push,Slide, Seal! Ways ReliaSeal will CHANGE your BEHAVIORS: -Want FRESH, FRESH,FRESH? Fresh never gets old, and neither will your food! Exposure to airreduces freshness by damaging food quality, so preserve your food frombacteria, mold and dust. -Who doesn’t want a CLEAN CAR and a CLEAN HOUSE?Avoid food spills by having heat sealers on hand for wherever you or your kidscarry food around. -Why let partially-consumed items go to waste? Daily youand your family are opening bags of food, so SAVE WHAT YOU DON'T EAT! Feelcomfortable that flavorful taste will be preserved when you later re-open andenjoy. -Are you a BULK SHOPPER? Never worry about buying bulk at Costco again!Save money by not letting that supersize bag of chips go to waste! -How aboutan AFFORDABLE GIFT for your friends! Freshness makes and keeps friends. (Andyou’ll feel better about eating your friend’s leftover party food too). Don'tyou wish every food item came with its own resealable zipper? Unfortunatelymany do not. But now there is a solution! What can be more simple and awesomethan quickly re-sealing an original bag for fresh food? Advance your own goodhealth, savings and security by not letting food spoil and having ReliaSealhandy! And how about additional security? We offer a 100% Guarantee FOR THELIFETIME OF THE PRODUCT. 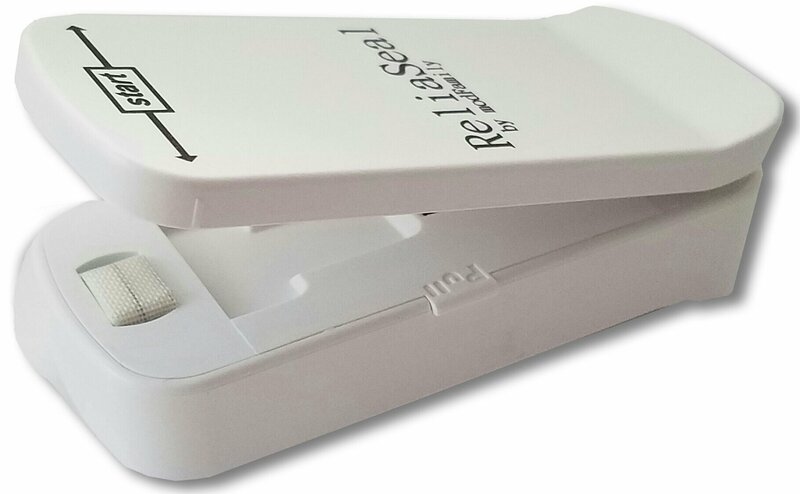 You'll receive a full refund and a new one shipped ifyou experience any challenges with ReliaSeal. Order Now and stock up yourkitchen. Great gift for anyone who appreciates fresh! Isn't that everyone?